� Mayer improved his AVP player ranking each season since he began in 2003 through 2009. � In reaching the semifinals in Hermosa Beach in 2006, Mayer and Keenan became the lowest seeded team (27th) to reach the Final Four since a team seeded 30th accomplished it in 1997. � In his career, Mayer has partnered with three college National Players of the Year (Jeff Nygaard, 1994, 1995; Brad Keenan, 2002; Sean Rooney, 2005). 2015: Mayer formed a partnership with Ryan Doherty, and the duo's six semifinals in the seven AVP events was the most on the Tour. They won in Seattle after knocking off the top three seeds while finishing second three times. They ended the year as the Tour's top-ranked pair, while Mayer was ninth in digs per set (4.72). Mayer and Doherty played in six FIVB events, advancing from the qualifier four times, with a best of fifth in Long Beach. 2014: Mayer and Keenan won the AVP season opener, giving Mayer his first win in over five years. The duo's other semifinal came in Manhattan Beach, finishing third. Mayer was seventh in digs per set (4.88). Internationally Mayer and Keenan played one FIVB event, advancing from the qualifier to place ninth. At the end of the year Mayer teamed with Theo Brunner for two FIVB tournaments, with a best of fourth. 2013: Mayer and Keenan played in two FIVB events together, advancing to one main draw and finishing 17th. On the AVP Tour, Mayer and Keenan played in all seven tournaments, with their best finish of third coming in the season finale. 2012: Mayer began a partnership with Brad Keenan, playing in six FIVB events together. The duo advanced to three main draws, with a best of 17th. 2011: Mayer played on three domestic tours with Prosser, finishing with two seconds and three thirds in their eight events together. 2010: Mayer began the AVP season with three events playing alongside Nygaard. In the next four tournaments Mayer partnered with Prosser, with a best of second place. 2009: Won his first career title in San Diego in May with Nygaard. As the seventh seeds, they became the lowest seeded duo to win an AVP event since Boulder in 2005. The pair also advanced to four other semifinals during the year, and ended as the fourth-ranked team on tour. In the season-ending individual event, Mayer finished fifth. Mayer played one FIVB tournament with Matt Fuerbringer, placing 17th. 2008: In the season opener Mayer placed seventh in his first event with Jeff Carlucci, and after three tournaments played once with Will Strickland. He then formed a partnership with Jeff Nygaard, placing fifth in their first outing. In Hermosa Beach the pair advanced to the semifinals, and also added three more fifth-place finishes. Mayer earned his first top 20 ranking, at 18th. He was seventh in digs per game (5.06). 2007: Played in 16 events with six different partners, including brothers Scott and Kevin Wong. He reunited with Prosser and had a season-best seventh place finish. Mayer was eighth in digs per game (4.56). 2006: Began a partnership with Brad Keenan, a former collegiate teammate at Pepperdine, playing in the qualifiers in their first five tournaments. After failing to make the main draw in the first two outings, the duo placed 25th and then 17th before a record-tying performance in Hermosa Beach. The pair won three qualifier matches then proceeded to finish third, tying for the highest AVP finish by a qualifier. The high finish secured an automatic main draw berth for Mayer the rest of the season. Immediately after the Hermosa Beach event, he and Prosser competed in the World University Games in Cyprus, claiming a Bronze medal. 2005: Started the year with four tournaments alongside Rooney, with a best of 13th. His final three events came with two different partners, including twice with Matt Prosser. 2004: Mayer played three events with Mintz, collecting his first paycheck in Huntington Beach. His final tournament of the year came with Sean Rooney, a college teammate from his 2005 National Championship team. 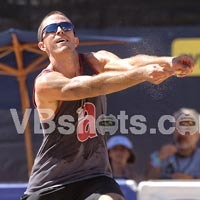 2003: Mayer made his pro beach volleyball debut in a qualifier in Hermosa Beach with Yariv Lerner. He played three times with Lerner during the year, with a best of 33rd. College: Mayer started out at Los Angeles Pierce Community College, where he led the team to the 2002 California state championship while earning MVP honors in the tournament as well as in the conference. He transferred to Pepperdine and immediately became the starting setter, guiding the team to the National Championship match. After two years as the starting setter, he switched positions, briefly becoming a libero before settling in at opposite hitter, starting on the 2005 National Championship team. He left the school fourth in career assists and seventh in career digs. Personal: Mayer was the head men's volleyball coach at Santa Monica College, and was assisted by fellow AVP players Yariv Lerner and Billy Allen. Mayer was named co-Western State Conference Coach of the Year in guiding the team to the 2008 conference championship. He also spent four seasons as an assistant coach for Loyola Marymount's sand volleyball program. In the summer of 2015 he was named as the head coach of LMU's beach volleyball team.